Character. Each book features a strong female character: Katsa (Graceling) is “Graced” with what others think is the power to kill, but she comes to realize is the power to survive. Fire doesn’t have Katsa’s physical strength, but she has mental grit, and a determination to use her “monster” powers of influence only for self-defense, not to control people as her father did. Bitterblue is neither a Graceling nor a monster, but a queen – and she must figure out how to put her kingdom back together after her father’s manipulative 35-year rule. Setting. Cashore’s talent for world-building is comprehensive. Graceling and Bitterblue take place in the Seven Kingdoms (largely in the Middluns, Monsea, and Lienid), where some people are born with two different-colored eyes that denote a Grace – some kind of special power – and are subject to their kings’ control. Bitterblue takes place in Monsea, but there is news of uprisings and rebellions in other kingdoms, and the discovery of a tunnel that might lead to an entirely new land. That new land is the Dells, where Fire takes place. There are no Gracelings in the Dells, but there are monsters: brightly-colored animals and, rarely, people whose beauty is compelling to others and can be used to mesmerize. Plot. Most of the kings in the Seven Kingdoms are corrupt, and King Leck of Monsea is beyond corrupt: he uses his Grace to control people’s minds. 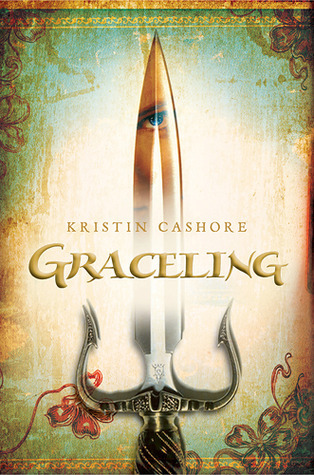 In Graceling, Katsa starts the Council to combat the kings’ unfairness; she teams up with Prince Po of Lienid to rescue his niece, Leck’s daughter Bitterblue, once they realize that Leck isn’t as kindly as his reputation suggests. In Fire, the Dells, too, is about to explode into conflict: the new king, Nash, and his brother Brigan, the commander of the army, face threats from powerful lords from the north and the south. The royal family wants Fire to use her powers to compel captured spies to give up their secrets; she is reluctant, because her father Cansrel used his monster powers to influence King Nax (Nash and Brigan’s father), but she agrees, after setting some ground rules. Just as war breaks out, Fire is kidnapped by a monster-trader and a peculiar, creepily sinister boy with two different-colored eyes. Theme. These books are full of adventure and intrigue; Katsa, Fire, and Bitterblue face significant physical, mental, and emotional obstacles, and they all insist on their independence, while also learning who they can trust and rely on. They are determined to do the right thing, but the right thing isn’t always clear; they are especially concerned that they not abuse their powers (Katsa’s Grace, Fire’s monster-ness, Bitterblue’s position as queen). The importance of independent thought – and the danger of the lack of it – is highlighted in each of the three books by the existence of those with the power to control others’ minds, read others’ thoughts and feelings, or communicate wordlessly. Trust and consent is especially important in romantic relationships; each character has to overcome some deception or lie of omission in a relationship and recover from it. The truth – in their own lives as well as the broader historical context – is valued highly. These three books neatly avoid the trilogy trap where second book merely serves as a bridge from the world-building of the first book to the action, climax, and denouement of the third. Fire is set in another land – the Dells, not the Seven Kingdoms – and precedes Graceling by a number of years. 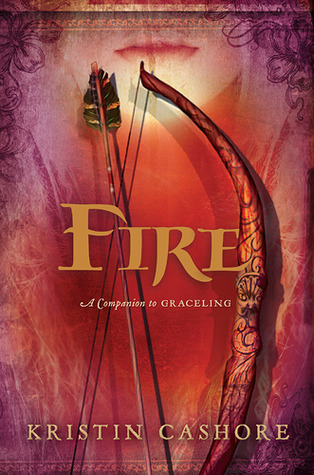 A reader could pick up Fire before Graceling and not, I think, be lost; a reader could also go straight from Graceling to Bitterblue – as I was tempted to do – and not be confused, though the ending of Bitterblue would be less satisfying. Romance is an element in each of the three books. Katsa and Po, in Graceling, remind me of Lyra and Will in Philip Pullman’s His Dark Materials trilogy (which is an exception to the “trilogy trap” I mention above) in the way that they face obstacles together. Katsa is staunch in her refusal to marry and insists on her independence; she also has no wish to be a mother, and takes measures to ensure that this does not occur. (Like Alanna in Tamora Pierce’s Song of the Lioness quartet, Cashore’s leading women have access to a version of birth control: in their case, it’s herbs.) But just because Katsa won’t marry doesn’t mean she’s a nun, and the attraction and love between her and Po is undeniable. Fire, too, insists on her independence, breaking off a sexual relationship with her longtime friend Archer when he becomes jealous and controlling (hypocritically so). “You don’t love me as much as I love you,” he says to her, and she replies, Love doesn’t measure that way. Fire finds love with Brigan, the king’s brother and the commander of the army; having seen firsthand Cansrel’s effect on King Nax, Brigan is suspicious of Fire and guards his mind against her. Their relationship is a slow process, but is all the stronger for it as they learn to trust one another. Bitterblue begins to fall for Sapphire (Saf) while she is in disguise, and when he finds out her true identity, he is furious. His reaction causes Bitterblue to examine more deeply her identity as queen, and the wealth and power she has taken for granted. They reconcile (more herbs are required), but like many first loves, they are not meant to be; my guess is that Bitterblue ends up with Giddon, in whom she often confides and to whom she promises always to be honest. World-building, adventure, intrigue, and romance aside, the cover designs deserve to be mentioned. 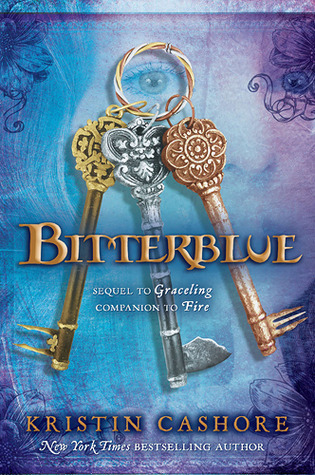 Beautiful and timeless, they represent their main characters’ talents (fighting/survival for Katsa in Graceling, archery for Fire and her friend Archer in Fire, ciphering and keys for Bitterblue) and colors (Katsa’s blue-and-green eyes, Fire’s hair, Bitterblue’s name). If you look carefully, there’s a face somewhere in each: one of Katsa’s eyes reflected in her knife, Fire’s face floating behind her bow and arrows, Bitterblue’s face behind the set of skeleton keys that gain her entry to Leck’s rooms. But the faces are not so much a part of the image that they will look dated a decade or two from now. Graceling, Fire, and Bitterblue were every bit as good as I’d been told to expect, and I’m sure I will be thinking about them and recommending them to other readers for years to come. I’m already tempted to re-read Graceling – my favorite of the three – but I’ll try to make myself wait. 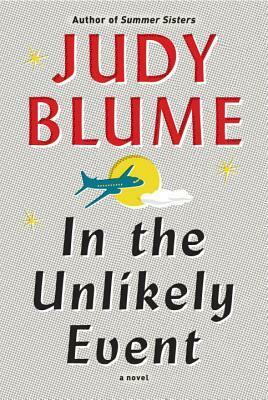 The audiobook versions of all three books are excellent, but Graceling, with a full cast, was again my favorite. (Don’t give the print books a miss, though – they’ve got useful maps, and Bitterblue has illustrations of Ashen’s embroidery cipher, the Dellian alphabet, and the bridges.) If you loved His Dark Materials and are looking for your next fantasy series, here it is. In addition to blogging here and at my personal blog (mostly photos of the dog or the garden, with occasional recipes), I also write for the Robbins Library blog and, nominally at least, I’m a contributor to Teaching the Tools, a blog about libraries and technology education. I just wrote my first full-length blog post for Teaching the Tools, a recap of Alison Macrina’s (The Library Freedom Project) presentation to the Minuteman Library Network (MLN) Teaching Technology Interest Group (TTIG), which I co-chaired for the past two years. Alison, who used to be a librarian at the Watertown Free Library, was kind enough to come to our June TTIG meeting and present about a variety of privacy tools. You can learn about the TOR Browser, Duck Duck Go, Privacy Badger, HTTPS Everywhere, Let’s Encrypt, and KeePass at Teaching the Tools. While I was there (and writing the annual report for the TTIG group), I added a blog post to recap our March meeting, including a link to the presentation slides on Teaching Technology: Assessment and Evaluation. If you teach technology at your library – even if your instruction is no more formal that tech-related questions at the reference desk – check it out. I’ve also received a few galleys that captured my attention: Ann Packer’s The Children’s Crusade, Lisa Lutz’s How to Start a Fire, Kate Atkinson’s A God in Ruins (companion to Life After Life), Annie Barrows’ The Truth According to Us (just finished), and Paula McLain’s Circling the Sun (up next). I’ve had The Te of Piglet on my bedside table since January, and I think I’m giving up on it. Partly the bedside table location is to blame, but the author’s writing style – with constant interruptions from Pooh and Piglet – is not endearing, and I don’t entirely agree with his philosophy. Though there are good bits here and there, I’m not enjoying it enough to continue. What will be my next selection from my TBR pile? Between Shades of Gray if I’m feeling like YA historical fiction, The Starboard Sea if I want a boarding school book, or The Waterproof Bible if I need Andrew Kaufman’s (All My Friends Are Superheroes) wacky blend of humor, magical realism, and emotion. Are you participating in a reading challenge this year? How are you doing? Have you discovered any gems?